When the weather get’s colder and it’s miserably rainy, like it is in NYC today, we usually get in the mood for some comfort food and a good glass of red wine. The other good thing? It’s Friday night and we’ve got a little extra time for dinner tonight – go out? Not in this weather… we’re thinking a dinner date in and a movie is much more appropriate. 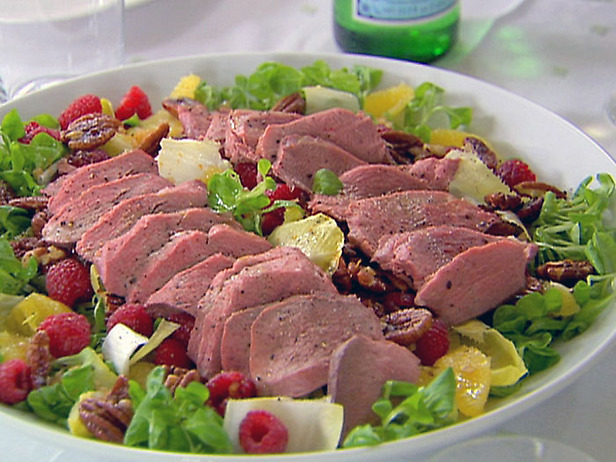 On tonight’s menu we’re opting for a warm duck salad – recipe courtesy of the Barefoot Contesa from Food Network’s website. Place the duck breasts on a sheet pan, skin side up. Sprinkle with salt and roast for about 20 minutes, until medium-rare. Remove from the oven, cover tightly with aluminum foil, and allow to sit for 10 to 15 minutes. Remove and discard the fat and skin on top (unless you’re making cracklings), slice the duck, and then cut the slices crosswise into julienned pieces. Meanwhile, in a small bowl, combine the shallots, sherry vinegar, orange zest, and 1 1/2 teaspoons of salt. Whisk in the olive oil and set aside. For the salad, trim the bottom half-inch from the endive and cut them diagonally into 1/2-inch slices. Separate the leaves and discard the cores. Place the slices in a large salad bowl. Add the mache leaves, oranges, raspberries, and toasted pecans. Toss with enough dressing to moisten. Gently toss in the warm duck meat and serve immediately. Now what would one pair this with, you ask? The Austrian Wine Marketing Board has made a major push for pairing Austrian wine with Asian food – this Asian inspired salad is a perfect example of how versatile Austrian wines can be with their pairing. On the one side, we can exemplify the vegetables with a crispy Gruener Veltliner, but at the same time, we can compliment the salad and duck with a weightier, fruitier and without robust acidity would be a match made in heaven. But, as I said, we’re looking for a red wine. I think tonight’s choice will be a medium-bodied Zweigelt with pronounced fruit, low acid and light tannins. Other options include St. Laurent and/or Pinot Noit…. heck, perhaps we’ll try them all. It’s Friday after all, isn’t it? Which wine would you pair with this delectable dish?